Successfully Added Electronic Bottle Opener - Built-in Battery, Stainless Steel, Light Weight, 500mAh Battery, Foil Cutter to your Shopping Cart. Efficiently open up any wine bottle in the blink of an eye with this electronic bottle opener. This wine bottle opener is the perfect accessory for all wine lovers out there. 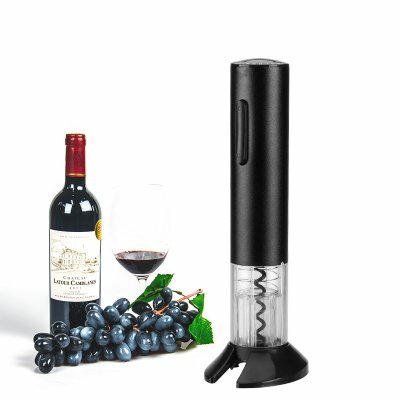 No longer will you have to use a hand-held corkscrew and risk damaging your bottle. With this electronic bottle opener, every bottle will be opened with a press of a button. Additionally, it also comes with a foil cutter. This useful accessory helps you to quickly remove the aluminum foil placed around the top of each cork. Thanks to this wine accessory, opening a bottle has never been easier. This cool gadget is powered by a built-in 500mAh battery. When fully charged, this battery is able to open up to 30 bottles. Thanks to this, you’ll be able to use it during multiple dinners and parties without needing to constantly recharge your bottle opener. It furthermore features a compact and lightweight design. This makes it easy to store or carry along. The next time you’re invited over for dinner or a party at your friend’s place, you can easily take this kitchen gadget with you. Your electronic bottle opener has been crafted out of high-quality food-safe material. Thanks to its stainless steel corkscrew, this electronic bottle opener is capable of smoothly removing the cork from any bottle. You’ll be able to rotate your electronic corkscrew in both directions. This makes it easy to dispose of the cork after removing it from your wine bottle. The next time you’re throwing a party at your place, you can be assured that all wines will be opened up without any hassle. This wine opener comes with a 12 months warranty, brought to you by the leader in electronic devices as well as wholesale electronic gadgets..